Win 2 sets and win the game. Answer 5 questions correctly and exchange the 5 Metallic bidding chips for 5 gold chips. When you have 5 gold you can now use these chips to bid for questions to win a set. 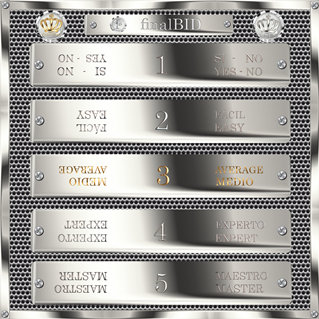 To win a set you must answer a minimum Level 3 question OR use a Total Bid chip and answer all 5 questions on the card. The Bidding board goes on the centre of the table. Each player receives a set of 5 Metallic bidding chips – $1, $5, $10, $25, $50 + 1 Total Bid chip and 5 gold bidding chips. Each player receives a LIMBO board. 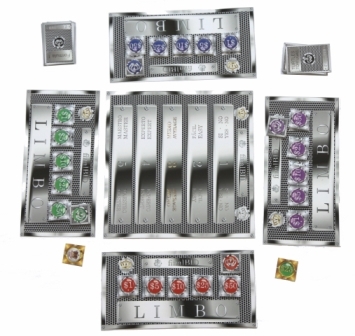 Place your metallic bidding chips in their positions on your board. Place a pack of cards (theme face up) on the table. The card’s theme has 5 related questions on the reverse side. The questions range in difficulty from Level 1 (Yes or No) to Level 5 (Master). The players Bid to get a question from the theme card or may pass. The auction continues and the highest bidder gets the question. Any player other than the Bid winner now takes the card and asks the relevant question. A correct answer allows the player to place a substitute Gold chip on their board. You must have 5 gold chips before you can begin to use them. Bids are formed by a combination of the question Level and the Value of a (ONE) chip. Example – Level 1 and $1 can be outbid by the same level and $5 etc. OR – By increasing the level – and any value chip. A bid of Level 5 & $50 can only be beaten by a Total Bid chip. Leave your chips on the board until there is a winning bid, the winner leaves their chip in its place. You may re-use a chip when you up the question level. Losing bidders recuperate their chips. BIDDING: To indicate your Bid place the relevant chip on the relevant question level line of the board. The auction continues until there is no further bid. You may make more than 1 bid. Every bid must be higher than the previous one. TURNS: The first turn to open the bidding and start the game falls on the owner of the game. Bidding then passes in turn from player to player – players may pass. If everybody passes, the rejected theme card goes to the bottom of the pack. Used cards are returned to the bottom of the pack with the theme/subject face up. An incorrect answer at ANY time during the game means the Metallic OR Gold chip goes into LIMBO. To recuperate a (ONE) LIMBO chip the player must miss a turn. TotalBid chips may be used at any time. With this chip you have to correctly answer all 5 questions on the card. This is a “use once only per set” chip and must go back in the box after use. Its tactical advantages will become evident with every game you play. SETS: Win a set and get a Master Crown token as recognition of this. This must be placed on its postion (top left) on your board for other players to see that you are in a position to win a second set and the game. The game includes crowns that you can wear (optional but recommended) to also indicate you have won a set. WINNING: You cannot win a set with anything less than a Level 3. The WINNER is awarded a Master King token and also a gold crown.